As a school we have always held the emotional and social needs of children at the heart of everything that we do. We know that in order for children to be able to learn and be successful members of our community they need to feel emotionally secure. 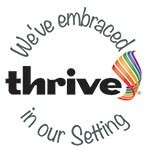 To enable us to support our children further we have begun to use the Thrive approach across the school. Thrive is a systematic approach which offers practical strategies and techniques planned from an online assessment tool. This enables us to assess children as whole classes to support their emotional and social needs as a group and can also be used for individuals or smaller groups who may need a little extra support with their emotional development. Support is planned through practical activities and establishing positive relationships and helps children to better understand their feelings and the feelings of others. Why might my child attend an individual Thrive session? Not knowing how to handle these situations can lead to anger, fear, frustration, sadness, anxiety, loneliness, confusion or withdrawal. These feelings are normal however, the Thrive sessions will help them to learn how to manage their feelings and provide them with strategies that will enable them to feel more emotionally secure and therefore support their learning at school. What happens in a Thrive session? These activities will be designed to meet the children’s needs and will be a way to build up trust with the child and also be a platform to open discussions about their feelings. For more information about Thrive you can explore the website on www.thriveapproach.com or speak to Miss Holmes our trained Thrive practitioner.